As religious polarisation in society deepens, political actors and policy-makers have begun to struggle with questions on the role of the dominant religion and how religion influences constitutional commitments and development. 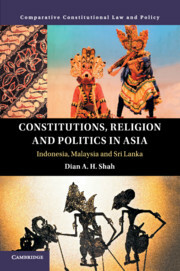 By focusing on Indonesia, Malaysia and Sri Lanka, Constitutions, Religion and Politics in Asia demonstrates how constitution-making and the operation of constitutional arrangements involving religion cannot be separated from the broader political dynamics of society. Although constitutions establish legal and political structures of government institutions and provide tools for rights protection, they do not operate in a vacuum divorced from the games of power and the political realities surrounding them. Here, Shah sets out how constitutions operate and evolve, and demonstrates how constitutional provisions can produce unintended consequences over time. A vital new source of scholarship for students and scholars of law and religion, and comparative constitutional law, and those interested in issues of constitutionalism and legal and political history in Asia.